(Toronto, Exile Editions, 1974), pp. 40-67. Copyright © Janine Zend, all rights reserved, reproduced under license. It was predetermined that he was to be born. The day and the hour and the minute and the second had been decided. The land and the city and the house assigned. The father and mother chosen. But something somewhere sometime went wrong. 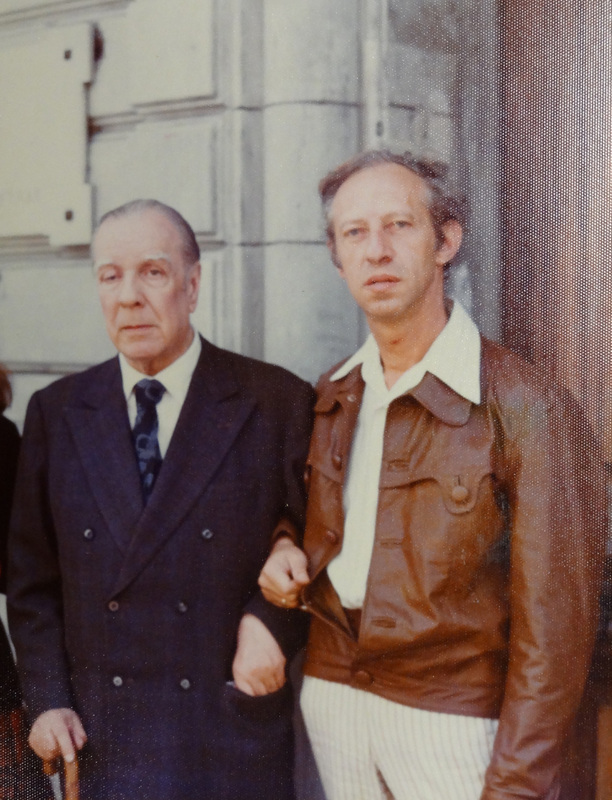 - Opening of "The Rock"
Jorge Luis Borges and Robert Zend, Buenos Aires, photograph, 1974, Janine Zend's private collection. As a chess player he was about 1600 but as a thinker he was easily a Grandmaster. Borges came up in a conversation. He got interested. A month later he was in Buenos Aires interviewing him for the Ideas program. Nice job eh, fly around the world interviewing people with ideas and get paid to do it! "His conversations with Borges are also commemorated in a remarkable collaboration between the two, 'The Key.'" "Zend’s meetings with Borges offered him the opportunity to cultivate in the older writer an important mentor for his narrative work. In him, Zend found a master of precisely the kind of writing that appealed to him and that he had been exploring in some of the earlier stories posthumously collected in Daymares. During their conversations, Borges talked about his fascination with keys. 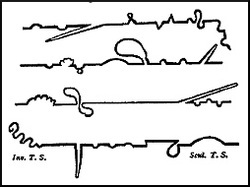 Zend suggested writing a story combining the idea of the key with Borges’ long-standing interest in labyrinths. Borges was delighted with the idea, but offered it back to Zend, who had originally proposed it, to develop into a narrative. Zend accepted the offer and began to take notes for what he expected to be a more or less linear story about a person’s search for the key to a labyrinth in which to become lost. However, on his return to Toronto, the papers he mailed back were delayed. Moreover, the editor at Exile Magazine, interested in publishing Zend’s work arising from his visit to Borges, proposed, in place of the linear narrative, a metanarrative take on the origin and evolution of the story’s premise. - Robert Zend, "The Key," p. 64. 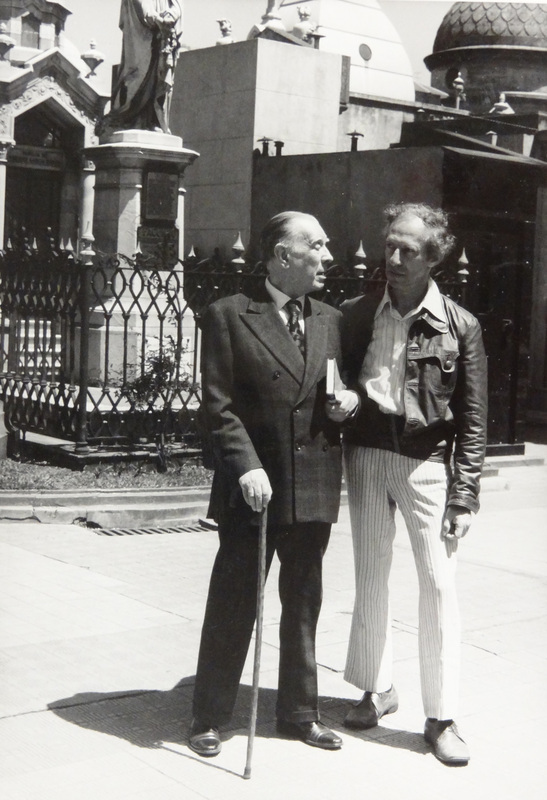 Borges and Zend, Buenos Aires, photograph, 1974, Janine Zend's private collection. Robert Zend, "The Key," Exile 2.2 (1974), pp. 62, 64. Captions added. Copyright © Janine Zend, 1974, all rights reserved, reproduced under license. Laurence Sterne, Tristam Shandy, ed. Howard Anderson (New York: W.W. Norton, 1980), p. 333. "As part of his exploration of the process of 'The Key,' Zend displays his visualization of the story’s metafictive pattern as an Escher-like paradox. 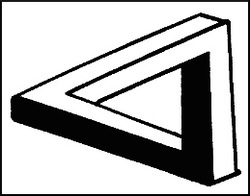 Any two angles of the triangular sculpture constitute a logically possible shape; the addition of the third angle makes the form impossible as a three-dimensional object. Although Zend does not explain the corresponding irrational concept of the meta-meta-narrative of 'The Key,' he is clearly, in works such as Oāb, fascinated by other such topological conundrums as the Klein bottle and the Möbius strip, which don’t lead anywhere but their own infinitely repeating surface. Somewhat similarly, the irrational triangle creates an endlessly iterable and labyrinthine path, corresponding to the journey of the story that never reaches its supposed destination (the planned narrative about a key to a labyrinth), but instead becomes the labyrinth itself for which the reader must search for a key within her- or himself. "Although Zend is the one who actually wrote the story, not Borges (or the table, for that matter), the gesture of acknowledging Borges as collaborator emphasizes Zend’s indebtedness to his mentor, which, as we have seen, is characteristic of Zend’s customary expression of gratitude to his “spiritual fathers and mothers.” (Oāb, Volume 2, p. 212) It also recognizes the phenomenon that authorship is never original but is dependent on a myriad of influences."